Includes mattress and 2 fitted mattress sheets. For additional bassinet mattress & accessories, please click here. Rock your sweet little one to sleep in our Rockwell Bassinet. 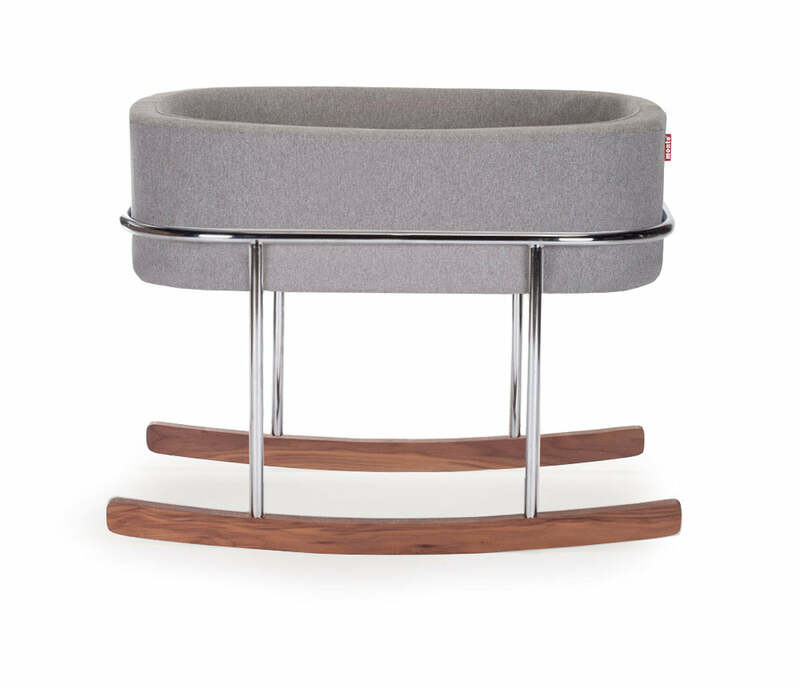 Our Rockwell bassinet is synonymous with ultimate modern luxury; it is the perfect combination of beautiful materials and a soothing rock for your little one. Its streamlined chrome stand with solid walnut rocking feet is beautifully contrasted to the soft upholstered basket that can be removed and transported to different rooms in your home (or the Grandparents' home!). When you are finished with the bassinet, the basket alone makes an excellent spot to store all your baby's new stuffies! If for any reason you would like to return your Monte Rockwell Rocking Bassinet within 14 days after receiving it, we will refund you the purchase price less a $49 return fee.